The default manner of launching a growth hack has been covered in the Integration Steps. But AppVirality lets you extend the user experience based growth hacking, to Mini & Pop-up Notifications. These can be used effectively, in situations like: immediately after a successful transaction, etc. The intent to share, in such instances, is most likely highest from a user experience standpoint. You may launch the growth hack from popup dialog. You can configure the popup dialog message and style from the AppVirality dashboard. AppVirality’s dashboard & SDK together, offer you a pre-loaded solution of an In-App Mini Notification whose looks and the behaviour (frequency & triggers) can also be controlled from the dashboard directly. 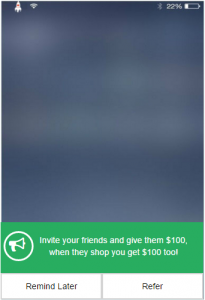 Let the App users know about referral program by showing mini notification or some banner to achieve great results. You can tweak the launch of this Notification. The modus operandi is pretty much same as stated above for Popup. You can easily configure the content and style for Popup & Mini Notifications from the dashboard. Enable/Disable Notifications : It contains check box options for enabling/disabling the Popup and Mini Notification, you can select which type of notification you want to display. Launch Message : You can set your own Launch Message to display for your existing users. Launch Button Text : You can set your own text for Launch Button. Remind Later Button Text : You can set your own text for Remind Later Button. Launch Message : You can enter your own Launch Message to display to your existing users . Icons : From this dropdown menu you can select from the available icons you want to be displayed with the Popup and Mini Notification. Background Color : This is to set the background color for Popup and Mini Notification. You can either select a color from the dropdown menu or give a color code of your choice. Message Color : This is to set the text color for the message to be displayed. You can either select a color from the dropdown menu or give a color code of your choice. Button Background Color : This is to set the background color for the buttons. You can either select a color from the dropdown menu or give a color code of your choice. Button Text Color : This is to set the text color for the buttons. You can either select a color from the dropdown menu or give a color code of your choice. Wait for N days after the first app launch : This rule is used to set the number of days to wait after the first app launch before start displaying the Popup. When set to N the SDK will start displaying the Popup after N days of first app launch. Wait for N app launches after install : This rule is used to set the number of app launches to wait after app install before start displaying the Popup. When set to N the SDK will start displaying the Popup after N app launches post install. Show every N days : This rule is used to set the number of days to wait since last Popup display before displaying it again. When set to N the Popup will be displayed after every N days. N times a user can see the notification : This rule is used to set the number of times a user can see the notification. When set to N(>0) Popup will be displayed for a maximum of N times.